The Maxxis Ikon was the second lightest tire in this shootout, and among the best all-around performers. 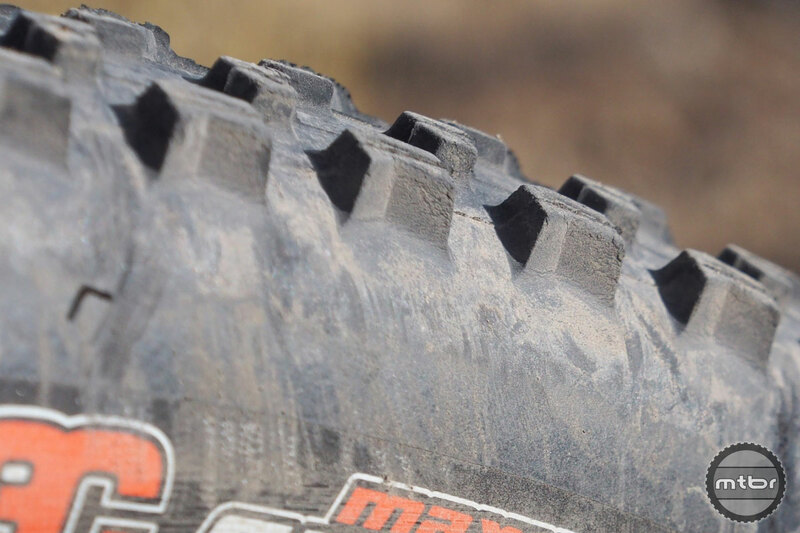 Billed as Maxxis‘ most versatile cross-country tread pattern, the Maxxis Ikon is designed to work on just about any trail condition outside apocalyptic mud. This race ready tire has a high-volume casing and fast rolling tread layout where a well-defined and closely spaced center helps keep speed high, while taller, more widely spaced side knobs dig in during hard cornering. Construction is 120tpi with a triple compound and EXO protection. The Maxxis website currently lists an expansive 31 size/construction Ikon options, including 26er and 27.5. 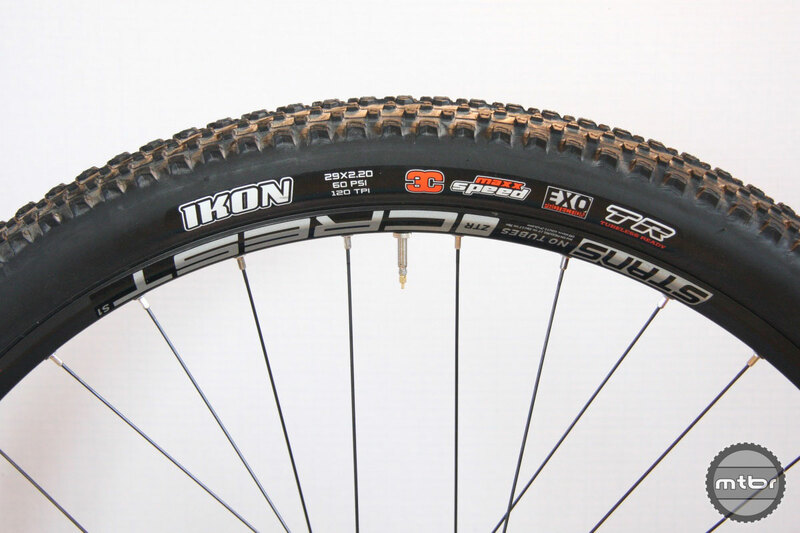 For our preferred 29er XC race platform, the Ikon comes in 2.0, 2.2 (tested) and 2.35. Compound options are Dual, 3C, 3C Maxx Terra, and 3C Maxx Speed, which is what Mtbr tested. The 3C Maxx Speed is claimed to reduce rolling resistance, and but also maximize tread wear and traction. The 3C Maxx Terra is softer, giving it better traction, but less durability. 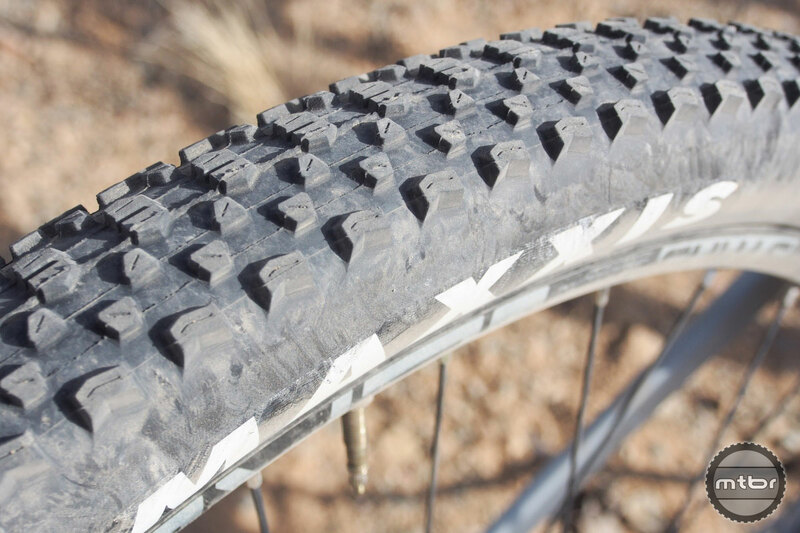 The Maxxis Ikon performs well in wide variety of conditions. 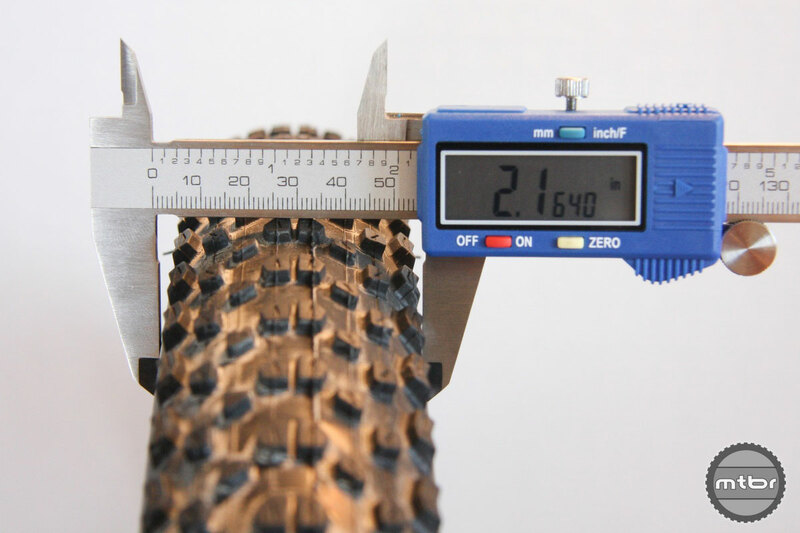 On the Mtbr Park Tools DS-1 Electronic Scale the Maxxis Ikon weighed 640 grams, which is equal to claimed weight. When mounted on a Stan’s ZTR Crest S1 aluminum wheels, which have a 23mm internal rim width, actual width measured by the Park Tools DC-1 Digital Caliper was 2.16 (versus the advertised 2.20). 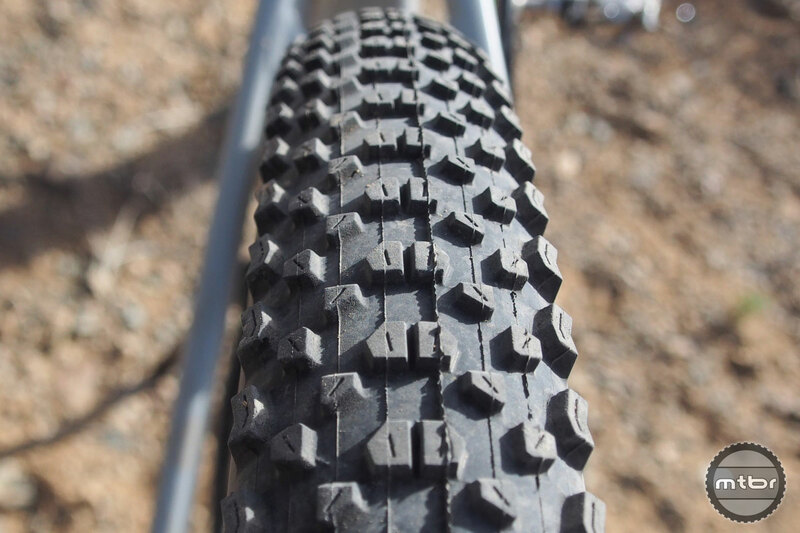 Mtbr tested the Maxxis Ikon on a variety of trail types, including hardpack, loose over hard, and high alpine rocky. The well-defined and closely spaced center knobs help keep speed high, while taller, more widely spaced side knobs dig in during hard cornering. 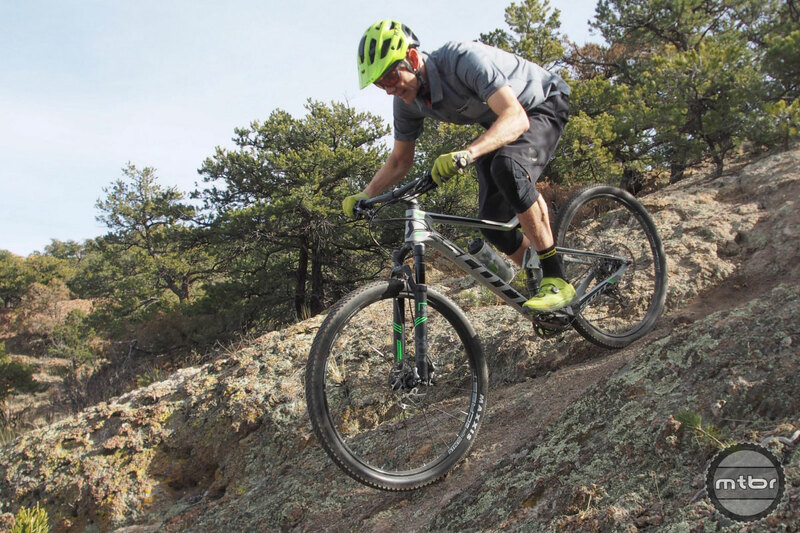 Versatility is the word that comes to mind when riding and testing the Maxxis Ikon. While not blessed with the same extreme low rolling resistance as the Kenda Saber Pro, Vittoria Mezcal, or Schwalbe Racing Ralph, the Maxxis Ikon was generally more confidence inspiring in a wider variety of terrain. 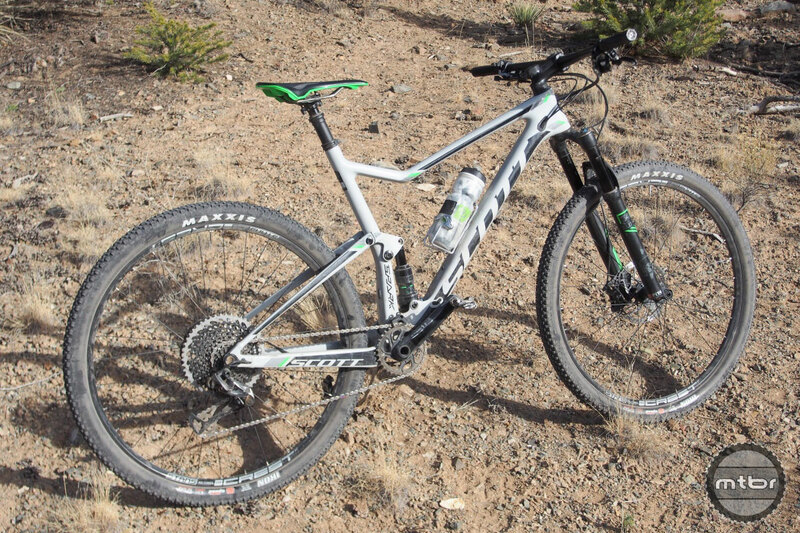 Mtbr spent most of our Ikon test time on the loose-over-hard (and bone dry) trails near Salida, Colorado. But despite sketchy, loose conditions, the Maxxis Ikon held its own, maintaining traction both in straight line steeps and marbly corners. And while we didn’t sample the Ikon in any truly muddy conditions, it fared well on softer terrain, providing plenty of bite but never packing up. However, we did notice some early signs of knob degradation on the cornering knobs, meaning there’s a price to pay for the extra grip when leaning your bike over. The Maxxis Ikon was also the second most expensive tire in this test ($77 for the 3C Maxx Speed/EXO/TR combo), trailing only the Schwalbe Racing Ralph ($92). There was some premature side knob wear during testing. The Maxxis Ikon was also one of the easier tires to set-up tubeless. 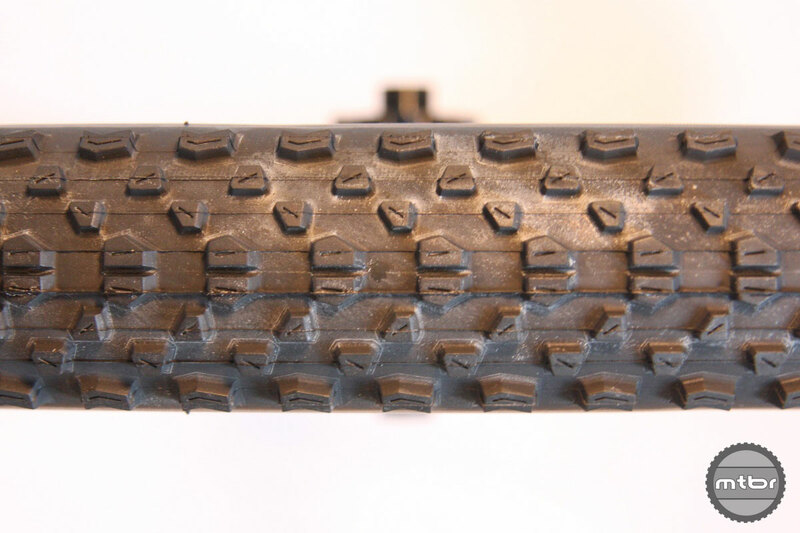 They slipped onto Mtbr’s Stan’s test wheels without hassle, and the bead snapped right into place when blasted with air from our dual chamber Topeak floor pump. Add some Stan’s tire sealant and overnight air leakage was negligible. 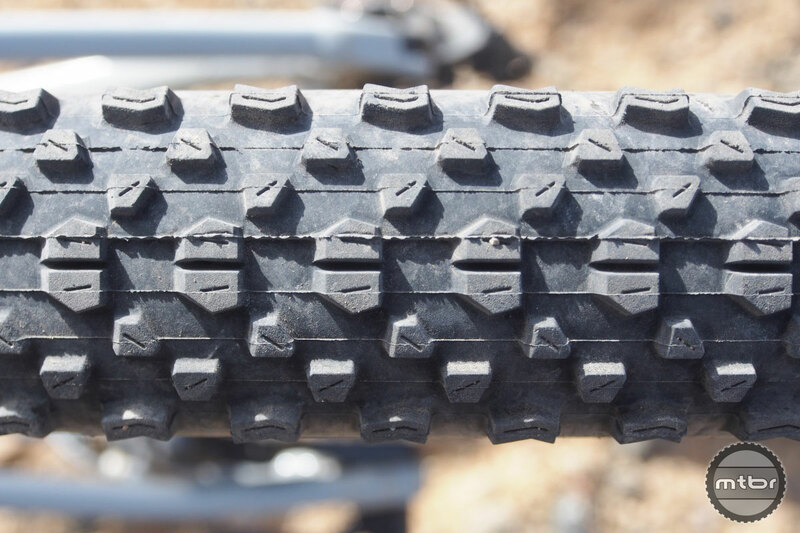 Bottom line, while not the fastest tire in this test, the Maxxis Ikon is arguably the best overall tire among the group if you’re looking for an option that won’t slow you down on XC race day, but can also hold its own on more aggressive trail rides. 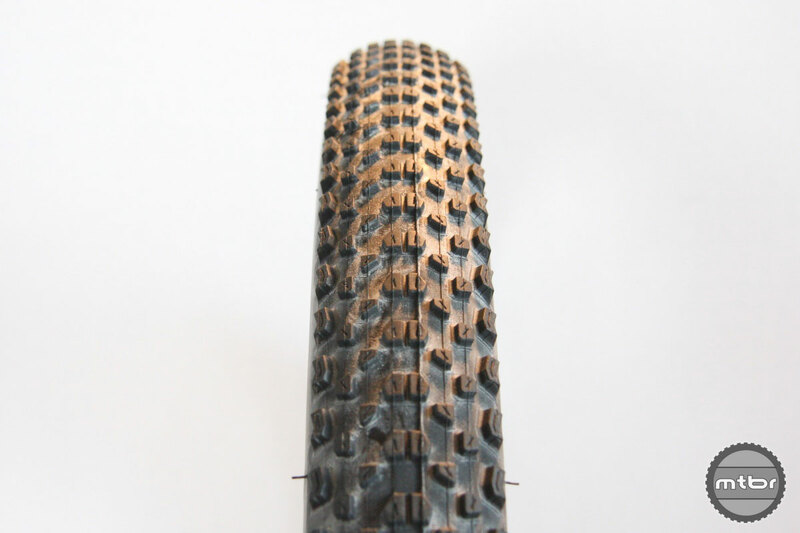 Indeed, I’d even consider mounting a fatter version of this tire on the rear wheel of my trail bikes because it will roll reasonable fast on long climbs, but not be too sketchy on the way back down. 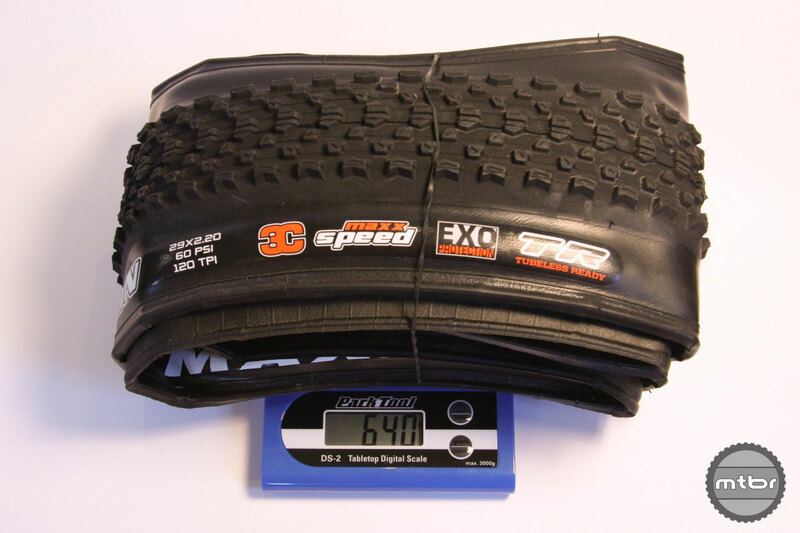 On the Mtbr Park Tools DS-1 Electronic Scale the Maxxis Ikon weighed 640 grams, which is equal to claimed weight. The Ikon was the second lightest tire in the test, but among the best all-around performers. The Ikons have performance enhancing siping on all knobs. The Ikon performs well in wide variety of conditions. The Ikon’s were one of the easier tires to set-up tubeless. The well-defined and closely spaced center helps keep speed high, while taller, more widely spaced side knobs dig in during hard cornering. On the Mtbr Park Tools DS-1 Electronic Scale the Ikon weighed 640 grams, which is equal to claimed weight. When mounted on a Stan’s ZTR Crest S1 aluminum wheels, which have a 23mm internal rim width, actual width measured by the Park Tools DC-1 Digital Caliper was 2.16 (versus the advertised 2.20). The 3C Maxx Speed compound is claimed to reduce rolling resistance, and but also maximize tread wear and traction. Construction is 120tpi with a triple compound and EXO protection. 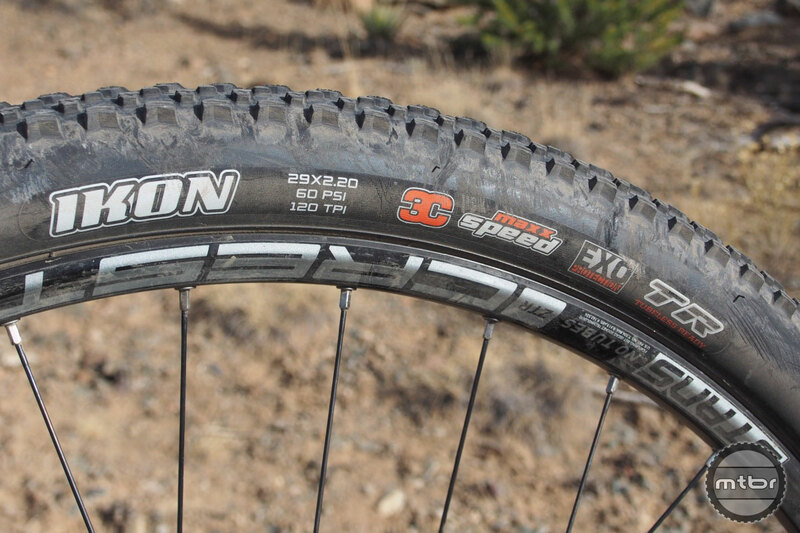 While not the fastest tire in this test, the Maxxis Ikon is arguably the best. Built for speed — and a diversity of trail conditions. From my experience, this has to be the hardest tire to mount tubeless out of the box on a narrow rim without a compressor. It did not work with a booster pump. Interesting. Did you mount this tire on both front and rear? I’ve been riding the Minion DHF on the front and Ardent Race on the rear. How would this tire compare? Thanks! I’m with Rob a 120 TPI Ikon was a PITA too floppy to pop into the rim (24mm). Even mounted one side with a tube first. I sold it & went back to a Ground Control. MAXXIS should make more offerings in the Ignitor like a 29 x 2.35. 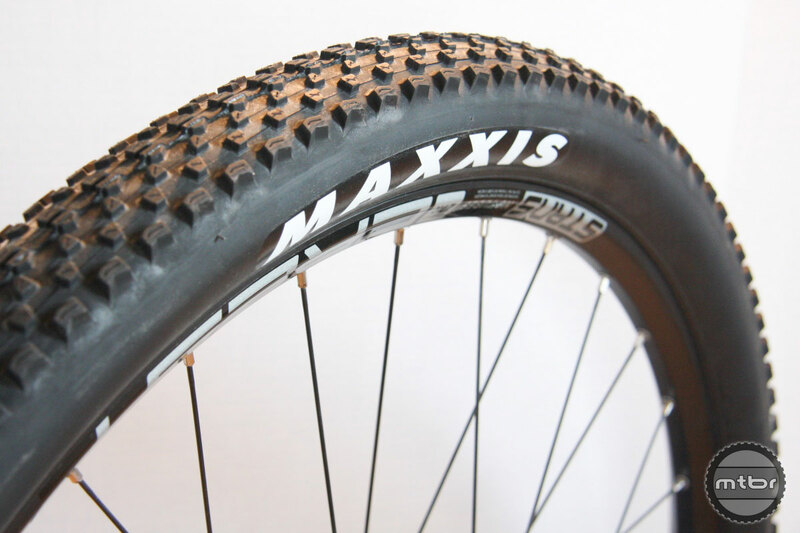 May I ask why you guys didn’t reviewed the Maxxis Aspen? I think the Aspen and Ikon are very close. Had to pick one and Ikon won out for overall versatility. Thanks for reading. The 29X2,35 version is amazing for a HT and as a F&R combo to speed up a trail bike! They are a challenge to get seated tubeless though! I have had very few durability issues with the tire and have been riding and racing on it for years! I have not tried the Aspen but have heard it is not as durable and not as good in the desert conditions we have here in Western Colorado. Thank for the review/shoot-out!